In August 1993, Bregenz, Austria issued a building permit for a new museum. Work on Peter Zumthor's design began in 1994; the roof was finished in November 1996. By the following June the administration building was ready, and on July 25, 1997, the Kunsthaus Bregenz opened its doors. On its tenth anniversary, this comprehensive volume documents its history and its increasingly strong exhibition program--over the five years between the end of 2001 and the end of 2006, the Kunsthaus put up a total of 31 exhibitions, all but one self-produced, and saw more than 20 new works created in conjunction with its architecture. Its programs place prominent thematic emphasis on interactions and connecting points between contemporary art and architecture/design; real space becomes a central theme--not just the museum's exceptional building, with its installation-friendly fa ade, but its location on the shoreline of Lake Constance, at the point where Switzerland, Austria and Germany come together. 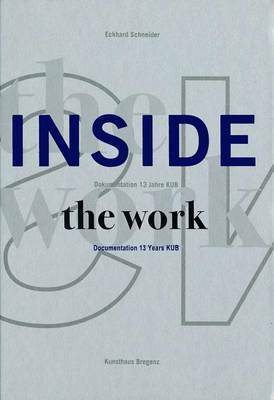 Inside the Work presents, in text and image, the curatorial practice and outreach work that make the Kunsthaus Bregenz stand out, and tracks its exhibitions through short artist statements and large-format illustrations.